This is one of my favorite side-dishes that my awesome husband makes. Enjoy! My family and friends thoroughly enjoy this blend of spices and the healthy benefit of using sweet potatoes instead of white potatoes. 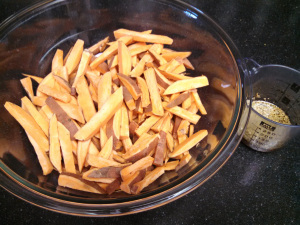 Not only is this a fantastic side dish, but a wonderful, fitness food that you can snack on raw. 1/4 tsp Chipotle flakes (optional for smoky spiciness) I use both when I make this. A ‘do ahead tip’ would be to mix all the spices into the oil and let sit for an hour. Wash the sweet potatoes and pat dry. Trim the ends, but do not skin the potato.